Janet Sabel, Attorney-in-Chief and CEO; Dreana Bellamy, 1199 Organizer; and Marlen Bodden, Staff Attorney in the Special Litigation Unit of CDP, were the main speakers in the celebration of Women's History at The Legal Aid Society. The Legal Aid Society celebrated Women’s History with a special program on the contributions women have made to the Labor Movement. Dreana Bellamy, Organizer for 1199, spoke about the leadership of women in 1199. The program included exhibits of the amazing contributions women made to the Labor Movement in SEIU and UAW. Janet Sabel, Attorney-in-Chief and CEO, praised the women of The Legal Aid Society, including members of ALAA, 1199, the caucuses of ALAA, exempt and management for their contributions to The Legal Aid Society and our clients. 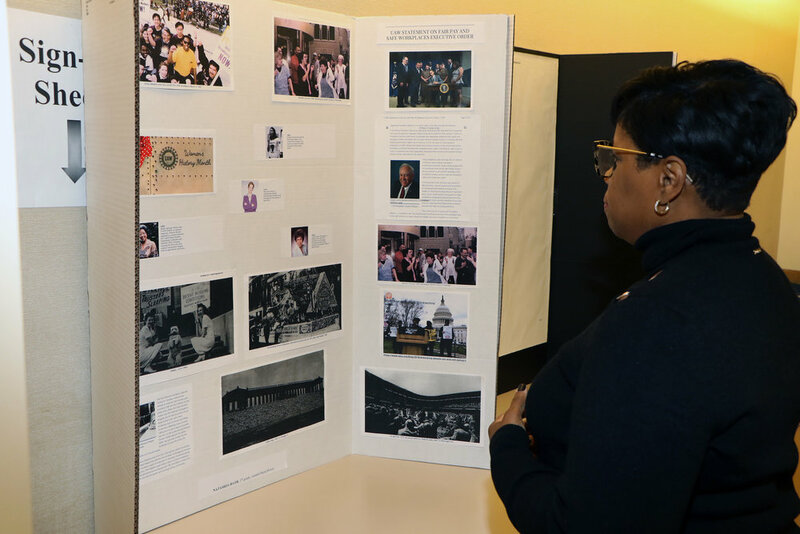 Dawne Mitchell, Attorney-in-Charge of JRP, looks over poster board depicting the amazing history of women in the labor movement.